GeniusDV’s Intensive Video Production training class is taught over two, 8-hour days. We teach a contemporary video production workflow through hands-on, real-world exercises and projects. This includes setting up and managing at least one entire project from beginning to end. The class progresses through all the key phases of video production including camera settings, lighting, and video production techniques. This class is also available in an ‘onsite’ training environment. For onsite training GeniusDV does not charge per individual. We charge a flat fee, which means there is no limit to the number of individuals that may attend. Please visit our onsite training page for pricing information. You need not have prior video production experience, but a general knowledge of the video production process and industry will be helpful as we use terms from the field. We also recommend that you either own or plan on purchasing a professional video camera. Overview of the video production pipeline. What’s required to produce a good video. Differences between DLSR (Digital Singles Lens Reflex) Cameras, broadcast video cameras, and mirrorless cameras. Color Grading: Creating a mood for your video content. Explore different camera manufacturer color spectrums (i.e, camera logs). Principles of videography: Lenses, Dept of field, Aperture, ISO, F-Stops, and Shutter Speeds. Lighting (exterior vs interior) techniques: Three point lighting, natural lighting, color temperatures. Creating your own social media channel: sharing your content with Facebook, Twitter, Instagram, etc. Using YouTube, Vimeo, Vevo, Ustream, ect. Ingesting Media, Transcoding, working with mpeg files, AVCHD, H264, and Intra-Frame Codecs. If you haven’t noticed by now, the web is crawling with video. The video you see on the web comes in different flavors of the good, the bad, and the ugly. We’re here to help you create the good stuff. 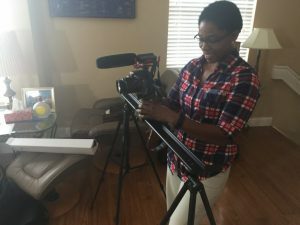 Whether your are an independent filmmaker, or a corporation making product demonstrations, or a scientist with invaluable content, you can deliver. As the cost of equipment has dropped dramatically in recent years, it has become easier than ever to produce money-making video content with minimal investment. We’ll show you how! You don’t need tens of thousands of dollars of compete–what you need is the education and the technique to efficiently crank out quality content. Interested in TV? We’ll teach you how to do spot news in order to become an immediate asset to your local media outlets, including television and newspaper. Have you noticed how the local newspaper websites are loaded with video content? To be successful in these types of businesses, you must be razor sharp in terms of efficiency. We’ll show you how to edit ‘in camera’ so your spots are streamlined for edit in post. Anybody can pick up a camera and point and shoot, but once they put the elements together and upload their media to the web, the results are often disappointing to say the least. It takes skill and practice to get good at anything, especially shooting video. Sure you can try it, go ahead. But with knowledge, information and education, you will know how to focus your practice to become a great storyteller. This will lead to work that you can be proud of, and then you can reap the rewards of being a video producer. A hands-on class at GeniusDV can teach you how to create a video for ‘YouTube’ for family and friends, or a full-length feature film. You will even learn the skills you need to become a TV news reporter. 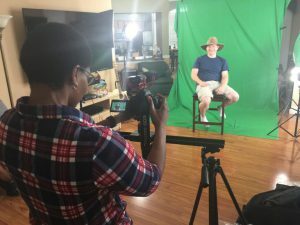 Whichever it is, if you can imagine it, then you can create it using video production techniques. Better yet, you can get paid for it, or find clients who need the work done. This philosophy is to keep it simple. Yep, that’s it. Professional-quality video production can be easy if you follow a few simple dos and donts. So with that being said, let’s get rolling. These classes are ‘hands-on’. We can use your camera, or you can learn using one of ours.